Performance art and Los Angeles, two subjects spectacularly resistant to definitions, illuminate each other in this searching study by Meiling Cheng. A marginal artistic pursuit by choice as well as necessity, performance art has flourished in and about "multicentric" Los Angeles for nearly four decades, finding its own centers of activity, moving and changing as the margins have reconstituted themselves. 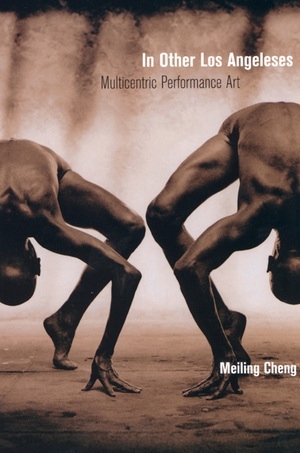 The notion of multicentricity serves, somewhat paradoxically, as the unifying motif in Cheng's imaginative views of center and periphery, self and other, and "mainstream" and "marginal" cultures. She analyzes individual artists and performances in detail, bringing her own "center" gracefully and unmistakably into contact with all those others. Without suggesting that her approach is definitive, she offers a way of thinking and talking coherently about particularly elusive, ephemeral artwork. Cheng describes performance art as "an intermedia visual art form that uses theatrical elements in presentation." Performance art, which uses the living body as its central medium, occurs only "here" and only "now." Because it is intentionally volatile, highly adaptable, and often site-specific, with emphasis on audience interaction, context is inseparable from the work itself. When Cheng writes about Suzanne Lacy or Tim Miller, Johanna Went or Oguri and Renzoku, Sacred Naked Nature Girls or osseus labyrint, she is conscious of her role in extending their creative expression. As members of the "virtual audience," readers and viewers of other documentation concerning performance art are arrayed outside the center represented by a given artist and the circle represented by the immediate witnesses to a performance, but all may entertain what Cheng calls a conceptual ownership of the work. A person who reads about a performance, she says, may feel more affected by this virtual encounter than a person who has seen it live, and may reimagine it as a "prosthetic performance." Cheng's writing draws us into the many centers where a vibrant contemporary art phenomenon and a fascinating urban environment interact. 2. Out of Order: Reading, Writing, Performing (in) L.A.